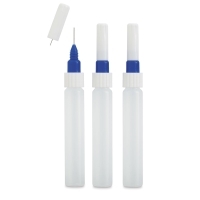 Fineline Precision Applicators are perfect for accurate, controlled placement. Use them to draw complex, precise designs with your favorite liquid media. They're great with acrylics, inks, gutta, watercolors, oil paints, silk dyes, stains, henna, waterbased adhesives, glazes, and more. The non-clogging, airtight cap-and-wire system guarantees your favorite media is ready for immediate use and won't dry out. Both the 1.25 oz (37 ml) oval bottles and the 1 oz (30 ml) tubes are easy to handle. 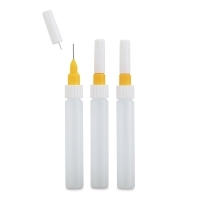 Choose a container and either 18 gauge (0.8 mm) or 20 gauge (0.5 mm) applicator needles. ® Fineline is a registered trademark.